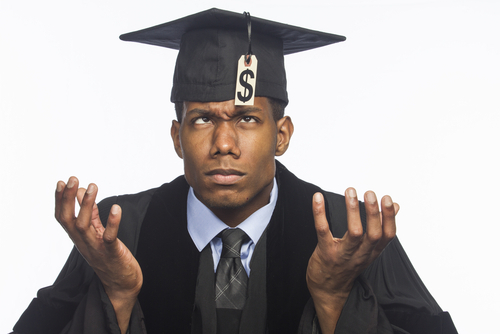 Debt-free college, boon or boondoggle? ≈ Comments Off on Debt-free college, boon or boondoggle? Is debt-free college for all a boon or boondoggle? A quick reference to data on graduation rates provides all that is needed to see that, barring other considerations, it’s hard to reconcile the waste with the gain. Then there’s the matter of how little such a program would contribute to correcting income inequality if measures are taken to prevent the waste. The first and most striking fact is that graduation rates, on average, are a miserable 60 percent after six years enrollment in a four year college program. The next fact requires a bit more thought. The rates are as low as they are due to colleges with “open admissions policies” having graduation rates of only sixty percent of the average—a miserable 36 percent! Given the speculation that affordability is among the factors affecting the drop-out rate, extrapolating from the data that this factor is most relevant in those institutions with high standards for admission suggests that this factor is not relevant to the issue. After all, it would be cured” by the program. One word, profitability, played the most significant role in the institutions with the lowest performance. Those most reliant on profit were the worst performing. Do not allow the cynicism that must immediately come to mind following this revelation, nor distract you from the fact that all colleges and universities operate as businesses. Even state funded colleges and universities must generate revenue to operate. OK, now let’s get skeptical if not entirely cynical: It should not take too much of a stretch of the imagination to accept that revenue flows are more important than the success of their students in for-profit institutions with open admissions policies. Stretching your imagination just a tiny bit more, it seems reasonable to suspect that these institutions have the most to gain by taking no measure to be more selective in their admission policies. Getting downright cynical about it, it does not seem unreasonable to suspect that such institutions will do their best to maximize the revenue stream from a debt-free college program. They need do nothing of course to benefit from the boost in enrollment they receive from instituting a debt-free college policy. Thereafter, loosening their performance requirements seems a logical possibility. It seems unlikely that no one has thought of this twist in the issue of debt-free college, and equally unlikely that such a policy would get enacted into legislation without some academic performance standard being requisite for participation. If it is not done at the institutional level, it will need to be done at the individual level. Otherwise, the idea seems too widely unpalatable that 40 percent of the revenue raised for the program from taxes on investors’ transactions would be wasted—or provide an unearned revenue stream for an unscrupulous “education” institution. Unfortunately, the structural inequality that has affected minorities will all but assure no meaningful gain among minorities from debt-free college without “affirmative action” policies that also address the needs of minority students for remedial education. Debt-free college can be a boon—but it won’t be easy.